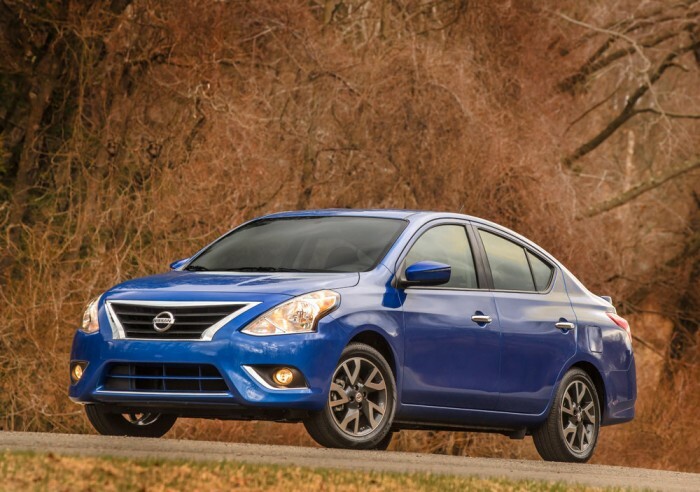 What’s New for the 2015 Nissan Versa Sedan? The 2015 Nissan Versa Sedan receives new front and rear fascias, minor interior design updates, and additional Bluetooth connectivity. The 2015 Nissan Versa Sedan is one of the more stylish cars to bear the Nissan name. From the subtle chrome grille accents and chrome door handles to the sleek lines and broad shoulders, the Versa Sedan stands out from the rest in the street, in the parking lot, wherever. It also features a rear spoiler that not only enhances its sporty look but also adds extra aerodynamic downforce for better performance. Under the hood, the 2015 Nissan Versa Sedan sports a 1.6-liter four-cylinder mated either to a next-gen Xtronic CVT transmission, a 5-speed manual, or a 4-speed automatic. It produces 109 horsepower and 107 pound-feet of torque. The CVT not only helps reduce fuel consumption but also enhances the driving experience by delivering smoother performance and quicker acceleration via variable gear ratios. The 2015 Nissan Versa Sedan engine features an innovative dual fuel-injector design that, combined with the CVT transmission, helps to significantly improve fuel economy. The 5-speed manual gets 27 mpg city/36 mpg highway, the 4-speed automatic gets 26 mpg city/35 mpg highway, and the CVT automatic gets a whopping 31 mpg city/40 mpg highway. The 2015 Nissan Versa Sedan offers a surprising amount of interior space given its relatively petite exterior appearance. Rear-seat passengers get up to 37 inches of legroom, making it easy to comfortably accommodate up to five people. The 14.9 cubic-feet of cargo room in the trunk lets you take everything you want along, but if you happen to need more, the 60/40-split fold-down rear seat makes it easy to bring tall and wide items for the ride. The 2015 Nissan Versa Sedan comes standard with traction and stability control, full-length side curtain airbags, front head restraints, and an advanced anti-lock braking system with electronic brake force distribution and brake assist. It also comes with a useful tire pressure monitoring system.